We are always interested to discuss how we can facilitate new cardiovascular clinical research projects. Thinking of starting a project at CCRF? Discussion about proposals is important at an early stage of planning to ensure all details of research governance and funding necessary to make use of the CCRF have been considered. From CCRF's point of view, this is very important in terms of strategic planning. From your point of view it is important to get up to date information about fees and availability. Projects are then provisionally registered with the Management Group and, once the details of the project are complete, the project can be approved via the Project Steering Committee and resources booked. Informal enquiries about new research proposals should be directed to the Clinical Director for CCRF Professor Paul Leeson or to the Operations Manager for CCRF Dr Nancy (Konstantina) Spagou. 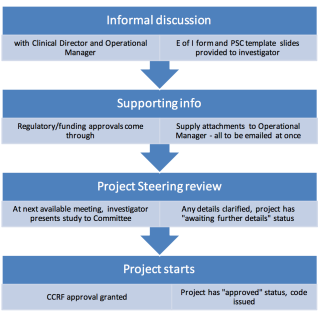 If you are running a research project in the CCRF and have enquiries about any aspect of project management please contact CCRF’s Operations Manager Dr Nancy (Konstantina) Spagou.